This book highlights the entire family of fielded combat rations. Rations are categorized into one of four platforms: Individual Rations, Assault Rations, Group Rations, and Special Purpose Rations. Each ration is described by its purpose, major characteristics, nutritional data, and preparation requirements. The mission of the DoD Combat Feeding Program is to ensure that America’s Warfighters are the best fed in the world. By investing in high risk/high payoff science and technology, and utilizing Continuous Product Improvement (CPI), CFD provides Warfighters with revolutionary combat feeding capabilities. 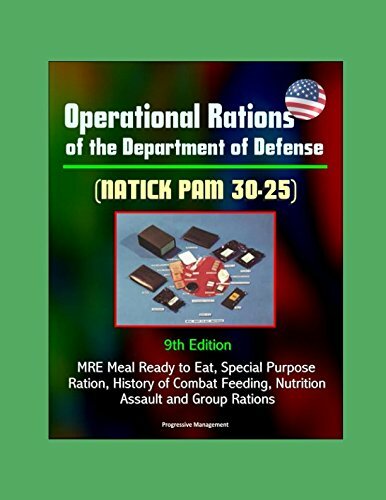 LIST OF ABBREVIATIONS * QUICK REFERENCE DATA * INTRODUCTION * HISTORY OF COMBAT FEEDING * CONTINUOUS PRODUCT IMPROVEMENT * NUTRITION * INDIVIDUAL RATIONS: * Meal, Ready-to-Eat, Individual (MRE) * ASSAULT RATIONS: * First Strike Ration (FSR) * Meal, Cold Weather/Food Packet, Long Range Patrol (MCW/LRP) * Modular Operational Ration Enhancement (MORE) * GROUP RATIONS: * Unitized Group Ration (UGR) * UGR-Heat and Serve (H&S) * UGR-A Ration * UGR-B Ration * UGR-Express (UGR-E) * Navy Standard Core Menu (NSCM) * SPECIAL PURPOSE RATIONS: * Meal, Religious, Kosher/Halal * Meal, Religious, Kosher for Passover * Meal, Tailored Operational Training (TOTM) * Go-To-War (GTW) Ration * Food Packet, Survival, General Purpose * Food Packet, Survival, Abandon Ship * Food Packet, Survival, Aircraft, Life Raft * Humanitarian Daily Ration (HDR) * Meal, Alternative Regionally Customized (MARC) * Tube Foods * Ultra High Temperature (UHT) Milk * FREQUENTLY ASKED QUESTIONS * CONTACT INFORMATION The mission of the Department of Defense (DoD) Combat Feeding Program is to sustain the Department of Defense’s most decisive weapons platform — the individual Warfighter. The contemporary operating environment requires state-of-the-art combat rations to provide for the nutritional needs of the Warfighter in a wide variety of situations, from peacekeeping to high-intensity combat and contingency operations. Under the auspices of the DoD, the U.S. Army Natick Soldier Research Development and Engineering Center (NSRDEC) DoD Combat Feeding Directorate (CFD) and Defense Logistics Agency (DLA) – Troop Support employ a total life cycle approach in developing, testing, evaluating, procuring, fielding, and supporting all military rations. These rations are a vital contribution to the overall quality of life of the individual combatant.